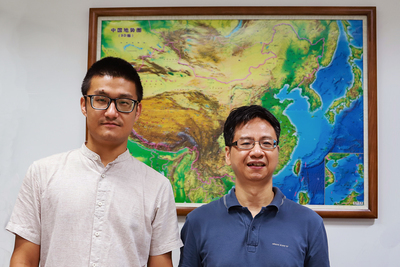 Illinois geology professor Xiaodong Song, right, and graduate student Jiangtao Li are authors of a new study that suggests rips in the upper mantle layer of the Indian tectonic plate are responsible for the locations of earthquakes and the surface deformation seen in southern Tibet. CHAMPAIGN, Ill. — Seismic waves are helping researchers uncover the mysterious subsurface history of the Tibetan Plateau, possibly lending insight to future earthquake activity in the region. The specifics of the deep geologic processes that occurred roughly 50 million years ago, when the Indian and Asian tectonics plates collided, have remained elusive. By collecting high-resolution earthquake data, geologists have generated a model that provides the clearest picture so far of the geology below the surface of the Tibetan Plateau. They report their findings in the Proceedings of the National Academy of Sciences. Song and his colleagues reveal that the upper mantle layer of the Indian tectonic plate appears to be torn into four pieces that dive under Asia – each at a different angle and distance out from the origin of the tear. The team gathered geophysical data from various sources to generate seismic wave tomographic images of Tibet that extend roughly 160 kilometers deep. They found that these newly modeled images match well with historic earthquake activity and with geological and geochemical observations. “The presence of these tears helps give a unified explanation as to why mantle-deep earthquakes occur in some parts of southern and central Tibet and not others,” Song said. The intact regions of crust between the tears are strong enough to accumulate strain to generate earthquakes. The crustal areas above the torn regions are exposed to more of the heat from the mantle and are therefore more ductile, the researchers said. That ductile flexibility makes warmer crust less susceptible to earthquakes. 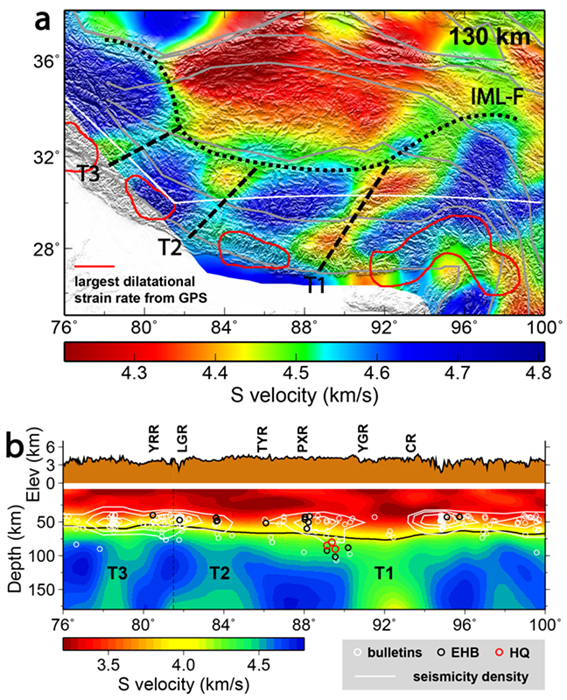 Seismic wave velocity images of the Tibetan Plateau in image a (map view) and image b (cross-section view). In image b, T1, T2 and T3 mark mantle tears, the circles indicate earthquakes deeper than 40 kilometers and the white contours show earthquake density. The model also explains some of the deformation patterns seen at the surface, including a series of unusual north-south rifts. Together, the earthquake locations and deformation patterns are evidence of a strongly coupled crust and upper mantle in southern Tibet, the researchers said. Armed with this new information, geoscientists now have a clearer picture of what role the Indian upper mantle plays in shaping the Tibetan Plateau and why earthquakes happen where they do in this region. This could help assess earthquake risk, the researchers said. “Overall, our new research suggests that we need to take a deeper view to understand the Himalayan-Tibetan continental deformation and evolution,” Song said. The National Science Foundation, the China National Special Fund for Earthquake Scientific Research in Public Interest and the National Natural Science Foundation of China supported this research. To reach Xiaodong Song, email xsong@illinois.edu@illinois.edu. The paper “Tearing of Indian mantle lithosphere from high-resolution seismic images and its implications for lithosphere coupling in southern Tibet” is available online and from the U. of I. News Bureau. DOI: 10.1073/pnas.1717258115.